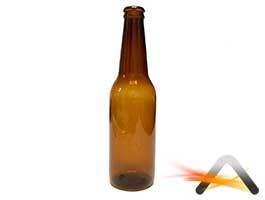 We've taken our most popular beer bottle and created a plastic version that will hold up to most action activity. Great for static displays, theatre productions. Anywhere that a broken glass bottle could be a danger. While not totally indestructible, this prop is blow-molded from durable PVC plastic and is quite durable and much safer than using a real glass bottle. Our new inventory of these is better and less expensive than our previously available plastic bottles. Not intended for use as a beverage container. For prop use only. Approximate Size: 2.375" x 2.375" x 8.75"